A 43 year old man and his 73 year old father were blown over by a very strong gust (Storm Ali) whilst walking along the track below Catbells, near Littletown. The younger man landed on his head, bit his tongue and lost consciousness for a short time. The father suffered bruising to his hip and knee. 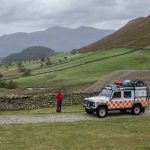 Keswick team arrived on scene in the Landrover, assessed and evacuated both down to the road where they were met by the NWAS land ambulance.